1976-04-08. New. Ships with Tracking Number! INTERNATIONAL WORLDWIDE Shipping available. Buy with confidence, excellent customer service! 1979-07-02. New. Ships with Tracking Number! INTERNATIONAL WORLDWIDE Shipping available. Buy with confidence, excellent customer service! 1989-03-04. New. Ships with Tracking Number! INTERNATIONAL WORLDWIDE Shipping available. Buy with confidence, excellent customer service! 1984-01-03. New. Ships with Tracking Number! INTERNATIONAL WORLDWIDE Shipping available. Buy with confidence, excellent customer service! Times Books, 1976-11-01. Hardcover. Used:Good. 1978-02-23. Good. Ships with Tracking Number! INTERNATIONAL WORLDWIDE Shipping available. May not contain Access Codes or Supplements. May be ex-library. Shipping & Handling by region. Buy with confidence, excellent customer service! Times Books. Hardcover. 0812906241 Like New Condition. . Fine. Times Books. Hardcover. 0812906241 New Condition. . New. 1979-07-02. Good. Ships with Tracking Number! INTERNATIONAL WORLDWIDE Shipping available. May not contain Access Codes or Supplements. May be ex-library. Shipping & Handling by region. Buy with confidence, excellent customer service! 1978-02-01. Good. Ships with Tracking Number! INTERNATIONAL WORLDWIDE Shipping available. May not contain Access Codes or Supplements. May be ex-library. Shipping & Handling by region. Buy with confidence, excellent customer service! 1976-04-08. Good. Ships with Tracking Number! INTERNATIONAL WORLDWIDE Shipping available. May not contain Access Codes or Supplements. May be ex-library. Shipping & Handling by region. Buy with confidence, excellent customer service! 2008-02-05. Good. Ships with Tracking Number! INTERNATIONAL WORLDWIDE Shipping available. May not contain Access Codes or Supplements. May be ex-library. Shipping & Handling by region. Buy with confidence, excellent customer service! Pocket. PAPERBACK. 0671790137 New Condition. . New. Pocket. PAPERBACK. 0671679740 New Condition. . New. Artisan Publishers. PAPERBACK. 0934666555 New Condition. . New. Pocket. PAPERBACK. 067179079X New Condition. . New. Artisan Publishers, 2008-01-02. Paperback. Used:Good. Near Fine Hardcover and Near Fine Collectible Dust Jacket Clean Pages NOT a library copy. NOT Price Clipped.U.S.A.:1977. Book. Near Fine.312 pp. Hardcover. 4th Edition. 8vo B/W Photos, Drawings. While it is easy to point to the over reach Of Barry Fells claims.This book broke ground,that did not want to be broken and was bold and fascinating. Great clean hardcover. NOT a library book. Since 1977 we pack our books carefully and with respect for the book and you..
USA: Wildwood House Ltd, 1978. Wildwood House Ltd 1978 1st British Edition Very Good/Near Fine DJ Uncirculated. Ex-library with usual markings o/w Fine. No wear to boards, tight bright photo illustrated pages. Light wear to spine bottom o/w Fine.. 1st British Edition. Hardcover. Very Good/Near Fine DJ. Pocket. PAPERBACK. 0671679740 Like New Condition. . Fine. Artisan Publishers. PAPERBACK. 0934666555 Like New Condition. . Fine. New York: Pocket Books, 1978. Speculation, with intriguing if not entirely persuasive archaeological evidence, that New England was settled by Ibero-Celts in the 4th-2nd centuries B.C. 312pp.. 1st Thus. Soft Cover. Fine. Large Octavo. Pocket. PAPERBACK. 067179079X Like New Condition. . Fine. Pocket. PAPERBACK. 0671790137 Like New Condition. . Fine. Times Books. Used - Very Good. Light to moderate shelf wear. Complete. Clean pages. Wildwood House Ltd, 1978. Hardcover. Good. Disclaimer:A copy that has been read, but remains in clean condition. All pages are intact, and the cover is intact. The spine may show signs of wear. Pages can include limited notes and highlighting, and the copy can include previous owner inscriptions. At ThriftBooks, our motto is: Read More, Spend Less.Dust jacket quality is not guaranteed. Times Books, 1976-11. Hardcover. Good. Pocket Books, New York: 1978. Softcover. Reading copy. It has long been taken for granted that the first European visitors to American shores either sailed with Columbus in 1492, or may have been Norsemen like Leif Erikson a full five centuries earlier. But the history of our land before that date has so far remained lost in native Indian legends. Now Harvard professor Barry Fell has uncovered evidence to replace those legends with myth-shattering fact. With illuminating text and over 100 pictures, he describes ancient European temple inscriptions from New England and the Midwest that date back as far as 800 B.C. Includes an Index. "A stunning book . . . an authentic landmark . . . destroys the premise of every previous text." - Peter Tompkins, author of Secrets of the Great Pyramid ISBN: 067179079X. New York: Quadrangle, 1977. hardcover. very good(-)/very good(-). Ancient Settlers in the New World. Illus. 8vo, 1/2 red cloth, d.w. sunned on spine, d.w. with a few small tears, corners of boards bumped. (New York): Quadrangle, (1977). Artisan Publishers, 2008-01-02. Paperback. Good. Times Books. Used - Good. Ships from Reno, NV. Shows some signs of wear, and may have some markings on the inside. 100% Money Back Guarantee. Shipped to over one million happy customers. Your purchase benefits world literacy! Pocket. PAPERBACK. 0671679740 Item in good condition. Textbooks may not include supplemental items i.e. CDs, access codes etc... . Good. New York: Pocket Books (Wallaby), 1978. First Thus. Paperback. Near Fine. Illustrated. Druids in Vermont? Phoenicians in Iowa? These are just a few of the interesting bits of information contained in this volume of American pre-history. 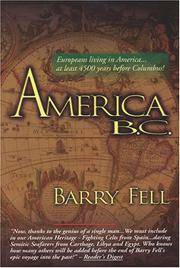 This groundbreaking work shatters many of the myths of America centuries ago. Paperback. No writing in the book. Profusely illustrated. 312pp., index. Full refund if not satisfied. Times Books. Hardcover. 0812906241 Item in acceptable condition! Textbooks may not include supplemental items i.e. CDs, access codes etc... . Fair. Times Books. Hardcover. 0812906241 Item in acceptable condition including possible liquid damage. As well, answers may be filled in. Lastly, may be missing components, e.g. missing DVDs, CDs, Access Code, etc. . Fair. Artisan Publishers, 2008-01-02. Paperback. Very Good. Trade Paperback. Artisan Publishers. 2008. Clean & unmarked. Pocket, 1989. Soft cover. Very Good/No Jacket. Crown Publishing Group, 1976. Hardcover. Acceptable. Disclaimer:A readable copy. All pages are intact, and the cover is intact. Pages can include considerable notes-in pen or highlighter-but the notes cannot obscure the text. The dust jacket is missing. At ThriftBooks, our motto is: Read More, Spend Less. Wallaby Books, 1978. First Thus Later Printing. Soft cover. Very Good. 8vo - over 7¾ - 9¾" tall. Very Good condition, no DJ. First Thus/later printing. No markings to the text block. No marks of personal identification or prior ownership. U S. A.: Pocket Book. Very Good +. 1978. First Thus. Softcover. 0671790137 312pp including bibliography and index Illustrations Harvard professor Barry Fell has uncovered evidence to replace the native Inidan legends with fact.Illumating text and over 100 pictures and ancent European temple inscriptions from New England and the Midwest that date as far back as 800 B.C. Cover is lightly soiled with faint crease near bottom outside corner of front cover .